As Yom Tov in the Diaspora ends Wednesday night, here is a summary of the biggest news stories to help our readers get up-to-date. The first two days of the Passover holiday end Wednesday evening in the Diaspora. In light of our extra day of Chol HaMoed here in Israel, Arutz Sheva has provided a summary to help our Diaspora readers catch up. Chief Superintendent Baruch Mizrahi, hy"d, a high-ranking commander in the Intelligence Division of the Israeli Police, was murdered outside of Hevron on Monday in a brutal terror attack. Mizrahi was shot by Palestinian Arab terrorists while he and his family were driving to the Passover Seder, in an attack which fatally wounded him and injured his pregnant wife. Mizrahi's murder has escalated tensions between Israel and the Palestinian Authority (PA) in the wake of the attack, causing Prime Minister Binyamin Netanyahu to cancel plans for PA and Israeli negotiating teams to meet in an effort to rekindle peace talks. 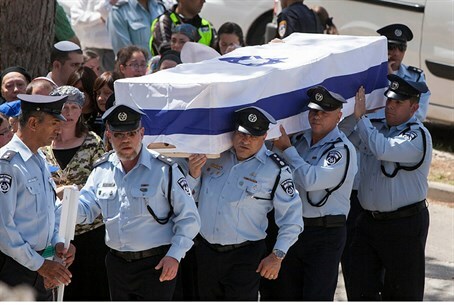 Mizrahi was buried in Jerusalem on Wednesday. Palestinian Arabs rioted once again on the Temple Mount on Wednesday, throwing stones and hurling firecrackers at Israeli Police. The Police closed the Mount Wednesday to Jewish visitors after the attack. Jordan turned to the United Nations Security Council after the incident, claiming "Jewish radicals" were to blame for the rioting and calling on Israel to stop "escalating" tensions by allowing Jews to visit Judaism's holiest site. Ukraine on the Brink of Civil War? Pro-Russian separatists took control of armored vehicles in Ukraine Tuesday and Wednesday, after an unsuccessful bid by Kiev to launch 'anti-terrorism' operations against the protestors backlashed, resulting in tens of soldiers defecting. The development has caused increasingly hostile rhetoric to be traded between the two countries; while Kiev insists Moscow is orchestrating the protests to take over eastern Ukraine, Moscow deems the Ukrainian army's intervention a "red line." The two sides are set to meet in Geneva Thursday for talks, but analysts say that the likelihood of success there is waning. Formal charges were filed Tuesday against Frazier Glenn Cross (Miller), 73, the former KKK member named as the gunmen in anti-Semitic shooting attacks on Jewish centers in Overland Park, Kansas on Sunday afternoon. The prosecution is seeking the death penalty against Cross, who is being charged with one count of capital murder and one count of first-degree murder.